Does your family celebrate Halloween? My kids have been looking forward to Halloween for quite some time now! 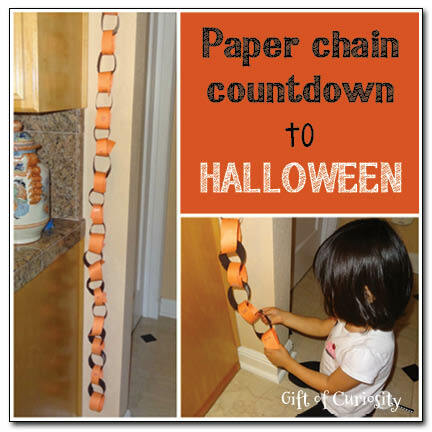 Now that we are in October, I thought we could start a countdown to Halloween with a simple paper chain activity. 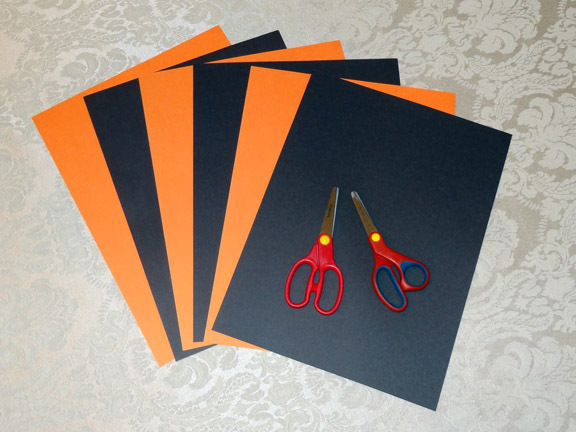 I gathered some orange and black construction paper as well as our kid-friendly scissors . 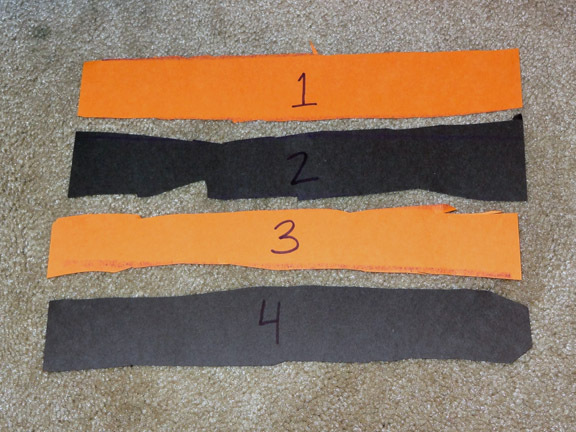 The kids cut the paper into strips about 1.5 inches wide. To make this easier for them, I drew lines on the paper for them to follow. Once they cut the paper into strips, I numbered them from 1 to 31 for each day in October. 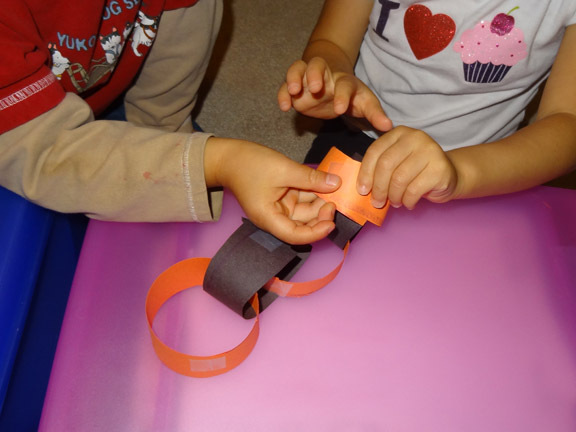 The kids then did a fantastic job of working together to assemble the strips of paper into a chain. Finally, we hung the chain in our kitchen. 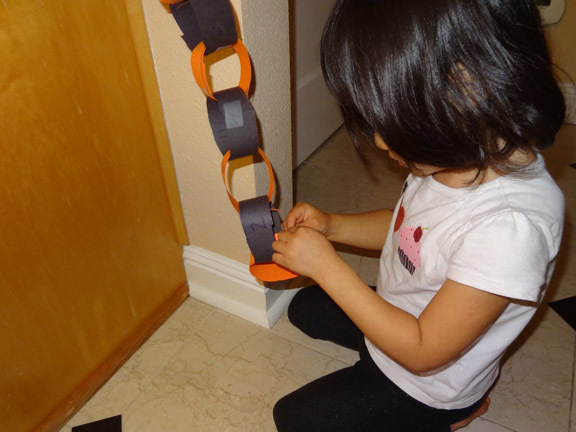 On October 1, XGirl found the first chain and tore it off. We are including this chain tearing ritual as part of our morning calendar time each day. The kids are already so excited! Thanks Amie, I am glad to be part of such a great group! Oh, countdowns are so much fun. Thanks for sharing with Afterschool! Thank you for linking up with the Hearts for Home Blog Hop last week. Your post has been selected to feature on Thursday’s Blog Hop link up over at Monsters Ed Homeschool Academy! Congratulations 🙂 Please remember to grab our “I was Featured” button to share on you post. 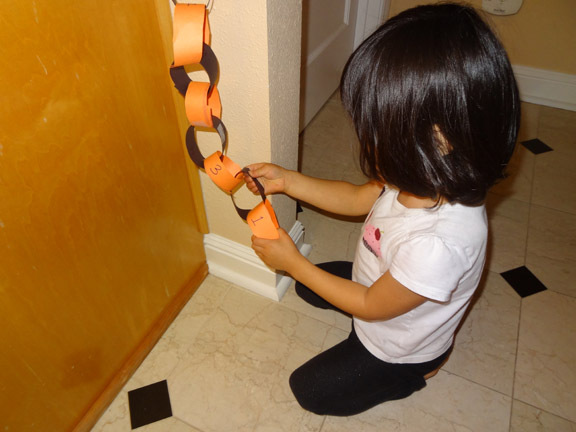 This is a great idea to practice counting while the little ones wait for Halloween. Thank you for sharing and for linking up this week to the Thoughtful Spot Weekly Blog Hop. What a wonderful countdown. I know my daughter can’t wait for Halloween. Thank you for sharing at Sharing Saturday!